My husband and I wanted a fun, but inexpensive, date night one Friday evening. 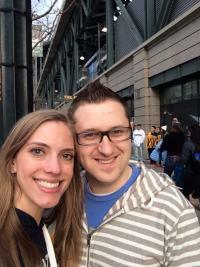 With the start of baseball season, a Mariners game was the perfect choice! We took the Central Link light rail from the Tukwila International Boulevard Station, where there is free parking, and got off at the Stadium Station next to Safeco Field. 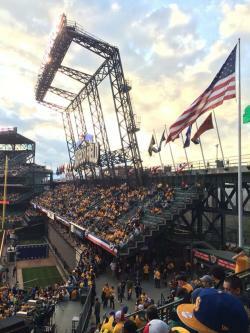 The night of the game was Felix Hernandez&apos;s first home start of the season and so the stadium was giving away free “Supreme Court” yellow t-shirts and King Felix signs to the first 25,000 fans. You can’t beat a free Mariners Tee! 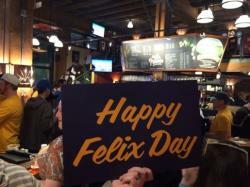 After getting our shirts and a poster, we left the stadium and went across Edgar Martinez Drive to the Pyramid Alehouse Restaurant for a pre-game pint! Seattle fans packed the outdoor beer garden and the whole of the interior as well, which amplified the atmosphere of excited fans. Surprisingly, we didn’t have to wait long for a locally made beer from this Pacific Northwest landmark, which first opened its Seattle doors in 1995. Back at the stadium, we managed to get through the crowd of 38,968 fans to our centerfield seats, which offer a great view of the field without breaking one’s bank. And sticking with our budget-friendly date night, we brought in unopened snacks from home in a small tote bag and an empty plastic water bottle that we could fill up at one of ballpark’s 66 drinking fountains. This was most convenient because it allowed us to enjoy food at the game without having to go over our budget. See the Safeco Field A-Z Guide for any questions you might have about rules at the ballpark for your next game! This game proved to be very entertaining with multiple home runs from the Mariners and lots of cheering and engagement from the crowd, including an iconic “Wave Cheer” that circled around the ballpark multiple times! Plus, the Mariners won 6-4 against the Oakland A’s. 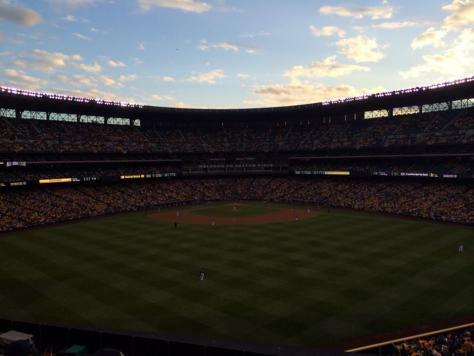 If you are from out of town and are planning to go to a Mariner’s game, check out this great ballgame package from Cedarbrook Lodge.